Millions of young Americans have lived through the fatigue and discomfort of mononucleosis. Now, new research suggests, but doesn’t prove, that the virus that causes the illness may be linked to an increased risk for seven other serious immune-system diseases. Those diseases include lupus; multiple sclerosis; rheumatoid arthritis; juvenile idiopathic arthritis; inflammatory bowel disease; celiac disease, crohns disease and type 1 diabetes. “Mono” is a contagious illness that occurs most often in teens and young adults. It’s caused by the Epstein-Barr virus, one of the most common human viruses. “Epstein-Barr virus infects over 90 percent of adults, and the infection lasts for a lifetime,” said study lead author Dr. John Harley. “The new results are building a strong case that this virus is also involved in causing a number of autoimmune diseases for at least some patients,” added Harley. He is director of the Cincinnati Children’s Hospital Center for Autoimmune Genomics and Etiology. “It is the kind of circumstantial evidence that is comparable to a smoking gun,” he added. However, one expert said people who have had mono shouldn’t panic. The findings “should not be a cause for alarm,” said Dr. David Pisetsky, a professor of medicine at the Duke University School of Medicine in Durham, N.C.
“In modern life everyone has been exposed and infected with Epstein-Barr,” he noted. “And if 99 percent of people have been exposed to Epstein-Barr, and only 0.1 percent have lupus, it means there really must be other factors at play that affect risk,” Pisetsky explained. “I really don’t think it’s a reason for undue concern,” he added. Pisetsky is also on the scientific advisory board for the Lupus Research Alliance. Harley’s in-depth genetic analysis revealed that at the cellular level, the Epstein-Barr virus shares a number of abnormal viral on-off switches (“transcription factors”) in common with those seven other illnesses. The review actually uncovered preliminary links to 94 additional diseases, including breast cancer. But Harley’s team said further investigation is needed to confirm those associations. Ask yourself if you have had a lot of strep throats, asthma, bronchitis or mono in your life. Are you one who has allergies, If so, make an appointment with us, and we can work together to prevent any of these diseases from attacking you. Australian researchers have found that a diet high in saturated fat is a prime suspect in the onset of osteoarthritis after finding that it changes the composition of cartilage, especially in the weight-bearing joints of the hip and knee. “Our findings suggest that it’s not wear and tear but diet that has a lot to do with the onset of osteoarthritis,” said lead researcher Professor Yin Xiao. “The main function of cartilage is to seal the bone ends in a joint and absorb pressure on the bones during weight-bearing movement such as walking,” said Xiao. “We found that a diet containing simple carbohydrates together with 20 percent saturated fats produced osteoarthritic-like changes in the knee. “Saturated fatty acid deposits in the cartilage change its metabolism and weaken the cartilage, making it more prone to damage. This would, in turn, lead to osteoarthritic pain from the loss of the cushioning effect of cartilage. But when the team tested lauric acid, a saturated fatty acid found in coconut oil, their findings were different. “Interestingly, when we replaced the meat fat in the diet with lauric acid we found decreased signs of cartilage deterioration and metabolic syndrome so it seems to have a protective effect,” said researcher Sunder Sekar. He said fatty acids could cause tissue inflammation throughout the entire joint. “We tested a variety of saturated fats and found that long term use of animal fat, butter, and palm oil could weaken the cartilage. “Replacement of traditional diets containing coconut-derived lauric acid with palm oil-derived palmitic acid or animal fat-derived stearic acid has the potential to worsen the development of both metabolic syndrome and osteoarthritis,” Sekar said. Other studies have found that coconut oil benefits the body in many ways, including reducing the deep abdominal fat that’s a risk for heart disease, and reducing the buildup of proteins in the brain associated with Alzheimer’s. A study published in The Journal of Alternative and Complementary Medicine found that yoga combined with coherent breathing instruction significantly reduced symptoms in people with major depressive disorder. Major depressive disorder (MDD), which is also known simply as depression, is characterized by persistent depressed mood along with a loss of interest in daily activities, low energy, and pain without an obvious cause that interferes with daily activities and enjoyment of life. It is commonly treated with medication or psychotherapy (talk therapy), or a combination of the two. In the study, adults 18 to 64 years of age with MDD participated in either three (high-dose intervention) or two (low-dose) yoga classes per week and practiced coherent breathing at five breaths per minute. Symptoms of depression were measured at the beginning and throughout the 12-week study. Volunteers who took three yoga classes a week were more likely to achieve lower depression scores after 12 weeks than subjects who took two classes. “The practical findings for this integrative health intervention is that it worked for participants who were both on and off antidepressant medications, and for those time-pressed, the two times per week dose also performed well,” says John Weeks, Editor-in-Chief of The Journal of Alternative and Complementary Medicine. The study was conducted by researchers from major institutions including Harvard School of Medicine and Columbia University College of Physicians and Surgeons. Other recent studies have found that yoga is beneficial for a number of health issues. A study by scientists at the University of Maryland School of Medicine concluded that yoga may ease low back pain and improve ease of movement in patients. Researchers from Boston’s Massachusetts General Hospital found that people who practice deep relaxation techniques, including yoga and meditation, make 42 percent fewer trips to their doctors, and lab use dropped by 44 percent when compared to the year before training. Yoga may also be a safe and effective way for people with arthritis to keep moving, according to a study from Johns Hopkins. A group of 75 volunteers with two common forms of arthritis, knee osteoarthritis and rheumatoid arthritis, were either put on a wait list or participated in twice-weekly yoga classes plus a weekly at-home session. After eight weeks, those who were in the yoga group reported a 20 percent improvement in pain, mood, and the ability to perform daily activities when compared to the control group. We could get into legal trouble if we advised you to go against the recommendations of your doctor; however, we can advise you to be as informed as possible about the risks involved in taking prescription meds. It goes without saying that this is big business – but like every big business, there is a dark side as well. Can we really trust the research – seeing as the same companies selling the pills are funding many of the medical journals and medical schools? And then we have the issue of doctors receiving kickbacks for prescribing certain drugs, after being “educated” on the benefits of the drugs by pharma salesmen. Remember that doctors do not get paid from your insurance company unless they write a prescription or a procedure, or a follow up with another doctor. Take a look at this list of seven of the most dangerous prescription drug types and see how they can hurt you. The use of sleeping pills has been associated with an increased risk factor for stroke. A study published by Petrov, et. al. in 2014 revealed that over-the-counter and prescription sleeping pills increased a person’s risk for stroke, independently and beyond any of the other known risk factors like blood pressure, personal history of heart disease, and vices like smoking and drinking alcohol. Isn’t it worrying that compared to all other factors that place a person at risk for stroke, sleeping pills top that list? This includes any medications that make you drowsy i.e. Benadryl, Night time Nyquil, Tylenol Pm, Valerian, and such. Did you know that deaths attributed to heart failure more than doubled from 1989 to 1997, while statins were first given pre-market approval in 1987? This is an alarming “coincidence” – to say the least. Interference with production of Co-Q10 by statin drugs has been proposed as the most likely explanation. Drugs that are meant to control your cholesterol levels may also be damaging your liver. Hepatotoxicity is not completely absent among people who undergo statin therapy, but it is uncommon. However, several studies have discovered that statins cause severe liver damage, especially in in dosages higher than 50 milligrams per day – a scary thing to realize when statin dosages can climb up to 80 milligrams per day when a person has high or uncontrollable cholesterol levels. Atorvastatin, Simvastatin, Fluvastatin, Lovastatin, and Pravastatin have all been linked to liver injury. Among the different drugs prescribed to manage hypertension, calcium channel blockers have been found to be the most common ones linked to adverse drugs reactions (ADRs). The most common ones linked to CCBs are bipedal edema, chest pain, hypersensitivity, and difficulty of breathing. A recent study published in 2014 discovered that immediate-release CCB use was positively associated with an increased risk for breast cancer. On the other hand, beta-blockers have been associated with several adverse side effects, such as increased incidence of post-operative dysrhythmia, troponin elevation, and heart failure, risk for hepatic failure, and small-for-gestational age births. While the positive effects of psychotropic drugs have been well-documented, there have also been studies revealed their adverse effects. A study conducted on the pharmacological treatment of Alzheimer’s disease found that antipsychotics increased a person’s risk for developing diabetes mellitus, heart disease, and stroke, and even overall mortality. The most popular drug prescribed for Alzheimer’s is Aricept or Donezepil and has been linked to nausea, diarrhea, malaise, dizziness, and insomnia. It is so easy to be prescribed a non-steroidal anti-inflammatory drug for pain, and even easier to purchase one from the pharmacy. What most people fail to realize is that NSAIDs are one of the leading causes of drug-related morbidity, especially in elderly and immunocompromised people. They have been directly linked to gastrointestinal problems, destroying the inner lining of the stomach and increasing the risk for ulceration and internal bleeding. Renal effects have also been linked to NSAID use, causing fluid and sodium retention and hypertension (and eventual cardiovascular problems). In worse case scenarios, people with severe kidney problems might even require dialysis. This seemingly innocuous drug is one of if not the most dangerous ones on this list. Another class of drugs to watch out for are those prescribed to manage high blood sugar, a characteristic symptom of diabetes. Liver damage has been linked to metformin use. In a study focusing on different ADRs, metformin-induced hepatitis was seen in a case of a person taking 500 milligrams of Metformin three times a day and insulin glargine. Liver damage can manifest as jaundice (yellowing of the skin and eyes) and discoloration of the urine and stool. Further liver damage can cause uncontrollable bleeding and insufficient clearing of toxins from the blood. The one category of drug on the list that is universally regarded as harmful to a person’s health is chemotherapeutic drugs. When people diagnosed with cancer are advised to undergo chemotherapy, they are prepped for the side effects they will undoubtedly experience along with it. Chemotherapeutic drugs are strong enough to kill rapidly proliferating cancer cells – however there is collateral damage: Healthy cells are also killed and it’s the oft-repeated hope with chemotherapy that it “kills the cancer and doesn’t kill you”. Weakness, hair loss, and appetite loss, are the mildest of these side effects, with more serious ones involving blood in the urine or stool, high-grade fever, severe pain over the chemotherapy infusion site, vomiting and diarrhea, and difficulty breathing. Chemotherapy is known to kill a significant number of cancer patients. Try to do everything you can not to start any of these medications. Once you have taken them for a while, your body gets lazy and does not want to work, and lets the pill do all the work. Then you are on them for life. Call us if you need help getting off medications, or hopefully never getting on any medications. Capsaicin is an ingredient in many topical skin preparations used to relieve pain. Capsaicin is available as a cream, ointment, stick, pad, gel, liquid, or lotion. It is marketed under many brand names including Zostrix, Icy Hot Arthritis Therapy, Capsagel, and Arthricare for Women. 1 – Capsaicin is the active component of chili peppers. Capsaicin is an irritant to humans, producing a burning sensation in any tissue it touches. 2 – Capsaicin is available over the counter. You do not need a prescription for capsaicin from your doctor. You can find products containing capsaicin in your drugstore for over-the-counter purchase. You should follow the directions given by your doctor or the directions on the label (there are different dosages or strengths of capsaicin available). For pain relief, capsaicin is usually used 3 or 4 times a day. You should rub the capsaicin cream or gel into the painful area until no more cream is visible on the skin. Wash hands thoroughly after applying capsaicin to other areas of the body. If the capsaicin was applied for hand pain, however, wash your hands after 30 minutes. 3 – Don’t use extra doses of capsaicin. Stick to the directions, but if you should inadvertently miss a dose, use it as soon as you remember — unless it’s close to the time of the next dose. 4 – Capsaicin has no known drug interactions. Though there are no recognized drug interactions with capsaicin, ask your doctor to be sure that you can use capsaicin, and continue to take your current medications. 5 – Capsaicin may cause a burning sensation. You will likely experience a warm, burning, stinging sensation when you begin using capsaicin. The sensation, which is expected when beginning use, may continue for 2 to 4 weeks. The sensation should lessen the longer you use capsaicin. Reducing the number of daily doses of capsaicin will not reduce the sensation, but it may reduce the pain relief achieved. 6 – Arthritis pain relief is not immediate. Even with regular use of capsaicin, arthritis pain relief will take some time. Pain relief from arthritis typically is evident 1 to 2 weeks after starting capsaicin. To prevent pain from returning, capsaicin must be continued. However, if pain is not better after using capsaicin for 3 or 4 weeks, talk to your doctor. It may not be worth it to continue. 7 – Capsaicin must be handled with care. Be aware of what can happen if you get capsaicin in your eyes or on other sensitive body parts because of the burning sensation it causes. If capsaicin gets in your eyes, immediately flush your eyes with water. To rid other sensitive areas of capsaicin and the burning feeling, wash the areas with warm soapy water. Keep capsaicin out of reach of children. 8 – Some people should not use capsaicin. Also, be aware that capsaicin should not be used by children under two years of age. 9 – Research supports the use of capsaicin for osteoarthritis and rheumatoid arthritis. 10 – Research also supports the use of capsaicin for osteoarthritis of the hands. Capsaicin 0.075% was evaluated for osteoarthritis and rheumatoid arthritis in a 4-week study, published in 1992. All of the study participants had significant hand pain and applied capsaicin to their hands four times daily. It was found that capsaicin reduced tenderness and pain in osteoarthritis of the hand patients, but not rheumatoid arthritis patients when compared to placebo. We have been very successful reversing RA, Rheumatoid Arthritis, osteoarthritis, and many forms of joint pain, so please call us if you need help with any of these conditions. The pineapple is native to southern Brazil and Paraguay, the modern fruit having been developed by native people from an almost inedible wild species. The most significant nutritional elements of pineapple are high quantities of vitamin C, manganese and the enzyme bromelain. We’ve researched and collected a significant amount of information about pineapple health benefits and presented them on this page! Arthritis Benefits – Bromelain from pineapple, when combined with trypsin and rutin could be helpful in reducing inflammation and knee pain for osteoarthritis sufferers, with possible effects on rheumatoid arthritis as well, although the evidence is scant for the latter. Note that while there is some bromelain in the fruit, it is much more abundant in the inedible stalk. However, bromelain is available in supplement form. Please do not take supplements of bromelain without having someone look over all the medications you are taking along with other supplements. Digestive Aid – Bromelain is an enzyme that has been used for centuries as a digestive aid owing to its ability to digest proteins. Some people do not make enough digestive enzymes naturally and benefit from enzyme supplementation. Anti-Blood Clots – There is some evidence that bromelain may help keep platelets in the blood from sticking together, which in turn may help prevent blood clots. If this is the case, it may also promote bleeding in some people and hence might be avoided by people prone to prolonged bleeding. Sinusitis Recovery – Some studies have indicated that bromelain from pineapple may help relieve the symptoms of sinusitis and speed recovery time. Sore Throat & Infection Remedy – The plant has been used for many years in traditional remedies as a diuretic, to quicken labor, for sore throats, seasickness and venereal disease. Native people in Panama use the leaf juice as a purgative, emmenagogue (stimulates menstruation) and to treat intestinal worms. Safety Note – People with anemia should limit their pineapple intake as manganese can inhibit iron absorption. Arthritis pain leads many people to become less active, which is the exact opposite of what they should do. A 150 minutes per week of moderately-intense and joint-friendly activity (such as brisk walking) is recommended for those with arthritis by the US Centers for Disease Control (CDC) and the American Arthritis Foundation. One in 10 American adults have arthritis-attributable activity limitations, and it’s even higher in the one third of Americans who are obese, according to the CDC. For 10 million people, that means they have difficulty walking for a quarter mile. Each extra pound puts four more pounds of stress on the knees, according to the CDC. Walking for 30 minutes at a time, five times per week is the recommended goal. If it is too challenging at first, it can be broken into 10-minute walks, three times per day. Consult your health care team to see if walking is the right exercise for you and whether any precautions are necessary for your individual circumstances. Walking Goal: To walk for 30 minutes at a moderate pace, five or more days per week. Use a pedometer to aim for 6000 steps each day in a dedicated walking workout. Walking Shoes: Get fitted for flat and flexible athletic shoes. The right athletic shoes will allow you to move with greater comfort and less pain. Stiff shoes fight your natural foot motion, while shoes that are too flimsy don’t give you the cushioning and stability you need. Visit the best running shoe store in your area to get fitted by experts. If you have been wearing slip-ons or velcro-tabbed shoes to avoid having to bend over to lace them, discuss this with the shoe store as there are athletic shoes with these features and lacing systems that may be easier for you to use. But remember that these shoes wear out a lot faster, and loose their support quicker. Walking Clothing: Wear clothing that gives you good freedom of movement. Wear a fitness t-shirt and fitness shorts, warm-up pants or yoga pants. Walking Poles: A pair of walking poles can help relieve pressure on your joints and maintain your shoulder mobility. Use handrail on a treadmill also. You will also burn more calories per mile at the same speed, enhancing your workout if you aren’t able to walk briskly. Where to walk: You can use a treadmill for your walking workouts, which can help build confidence and speed and won’t have any curbs, hills or hazards to negotiate if those increase your discomfort. But walking outdoors is good for the spirit. You can still avoid hills by using a track at a nearby school. Look for a walking route on asphalt or level natural trail which will have less impact on the joints than concrete sidewalks. Walking Warm-Up and Stretches: You may be stiff and need to wake up your joints and muscles before starting your walk. A warm shower before you begin may help. Begin by getting up and circling the room a few times or marching slowly in place. Then use the stretching routine to prepare your body for a walk. Adjust Your Posture: Good body alignment is key to walking with less pain and strain on your joints. You may have developed bad posture habits with arthritis and it can help to practice good posture in front of a mirror. Stand up straight, with your eyes forward and your chin parallel to the ground. Engage your core muscles by pulling in your stomach and tilting your hips slightly forward as you tuck in your rear. Now straighten up by pretending there is a string attached to the top of your head and, with feet flat on the ground, raise yourself up from your hips to the top of your head. Relax your shoulders with another couple of shrugs. Bend your arms. Now you are ready to walk. Walk at an Easy Pace for 3 to 5 Minutes: Continue your warm-up with an easy walking pace, bringing blood flow to your muscles and joints. Listen to your body and warm up for as long as it takes. If you have been inactive, do this 2-3 times per day at first before building up more time walking. Cool Down for 1 to 3 Minutes: Finish your walk by walking at an easy pace. You may want to end with the stretching routine again. Please share with family and loved ones. If you have RA in your family and you want to prevent getting it, or you already have RA or another form of arthritis, call us to see what you can do to alleviate your situation. Now, scientists have discovered that statins, which can be used to treat high cholesterol, asthma and acne, can also alter moods and make normally placid people angry and aggressive, violent and jealous, suicidal and even homicidal. Many diabetics are prescribed statins to lower cholesterol, but the statin drugs actuallyl increase your sugar levels, and there is a 40% greater chance of developing Parkinson disease and Alzheimers from the drug. Because of the close correlation between diabetes and risk for Alzheimer’s and dementia, you really want to be focusing on keeping your blood sugar under control. A new study has found that exposure to statins may put you at greater risk for diabetes, thereby increasing your chances of experiencing dementia or Alzheimer’s. 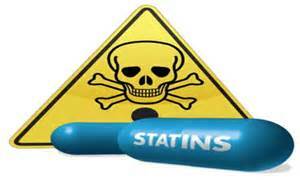 Statins affect blood flow to your brain. Occasional headaches and pressure is one symptom to watch for. Inflamation of the joints, bringing on a arthritis type of symptom is usually caused by statins. Research is presently linking statin drugs to platelet counts, and the interferrance of your body regenerating its own blood supply. Statins cause many deaths. High levels of Cholesterol does not.